At the start of the year, Mandy Len Catron wrote an article in the New York Times about 36 questions, which she and a research partner had asked each other. They were questions from a study carried out over 20 years ago, by psychologist Arthur Aron. Questions which Len Catron attributed to helping her and her lab partner find love. The reaction has been huge. 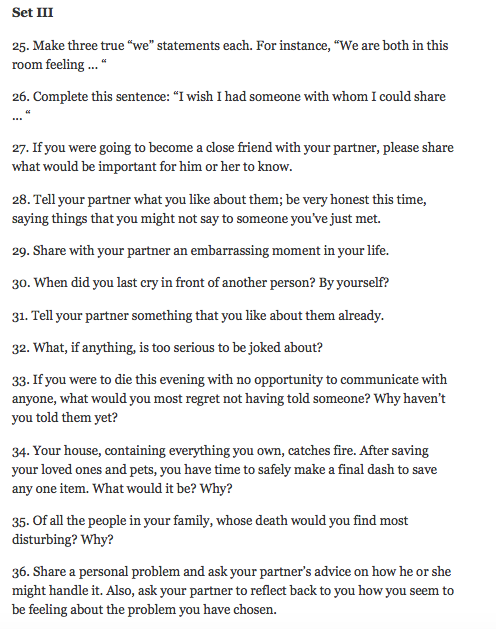 Firstly, the New York Times published the 36 Questions. Then a free app with the questions was released. Then a NYT reader set up a crowd funding appeal to raise money to turn the 36 Questions into a card game. All around the world, people decided to test the questions – there’s one nice example here on the Guardian, starring Bim Adewunmi (who appeared on Woman’s Hour with me this week). 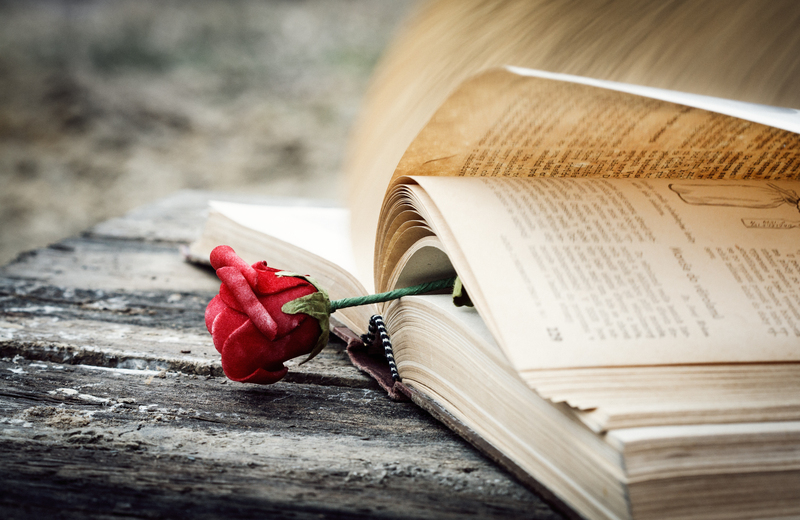 The questions can supposedly make strangers, or acquaintances, fall in love … but there are numerous stories of longterm couples also trying out the questions. It’s interesting, because some of the answers are likely to be territory already covered when you get to know someone. But equally some of the questions are things you might never expressly ask someone – Number 2 – Would you like to be famous? Number 7 – Do you have a secret hunch about how you will die? Some of the questions are far easier to answer than others. Number 5 – When did you last sing to yourself? compared to Number 18 – What is your most terrible memory? It was interesting chatting to Bim about her experience of doing the experiment for the Guardian. The response from readers was huge, and people got in touch with Bim to let her know about their experiences. Apparently the majority of the longterm partners who tried out the questions actually ended up having rows! So how did I get on with them? The Rugby Boy and I have now been dating for just over 4 months. Sorry, seeing each other. It’s a distinction he makes, not me. But then I guess when your girlfriend’s job is ‘Head of Dating’ for a global multimedia company, there’s a big difference between dating and seeing each other! Whilst I know how I feel about him, I’m yet to say the good old awkward L word. In part, probably because I’m stubborn and won’t say it until he does, but also because I’ve certainly fallen foul of saying it too soon before. 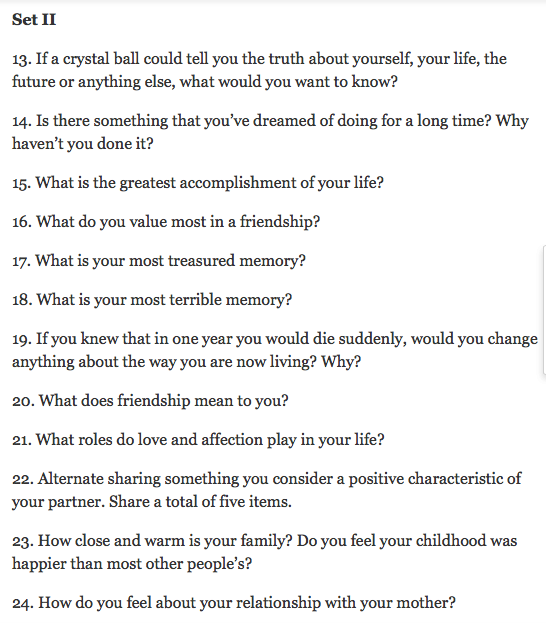 I was certainly intrigued about the 36 Questions, and I figured we were in a particularly interesting stage of our relationship to try them out. Would the questions draw us closer? Or would they just cause a row? Earlier this week Samsung TVs worldwide had a glitch, which left me and the Rugby Boy without our usual post-work Hollyoaks catch up. (Ok, so it’s me normally catching up on Hollyoaks, and him tolerating the background noise!) But the lack of TV provided a great opportunity to suggest the 36 Questions. The Rugby Boy was surprisingly open to the idea. And so we sat, snuggled on the sofa, my feet wedged under his legs, and my laptop perched on my knees. Some of the questions take more thinking through than others. Some questions have obvious answers, while others depend on your mood and other recent influences. We got to the end of Set 1 – 12 questions, and the Rugby Boy went to grab a drink. “Ready for the next set?” I asked, not sure how long it would take for him to tire of the exercise. He shrugged, “Go for it!”. Deciding to make it seem less like I was interviewing him, I passed my laptop to the Rugby Boy. Big mistake. Rather than empowering him, what it did was show him just what was to come! By Question 15, the Rugby Boy had called it a night. So that would be a no then! The interesting thing, is the night we did the questions, we actually ended up talking in bed for hours. Not about the questions or about our answers, but a deep conversation. Which makes sense. The questions do feel contrived – there’s no way of getting around that. But they do make you think about stuff you wouldn’t normally say to a partner. And can perhaps act as a gateway to a more normal-seeming, but in-depth conversation. 36 questions is a lot. It’s a real investment … and unless you’re doing a study, or being paid by a newspaper to take part, it’s quite a tough thing to do with a new partner. But it is interesting. 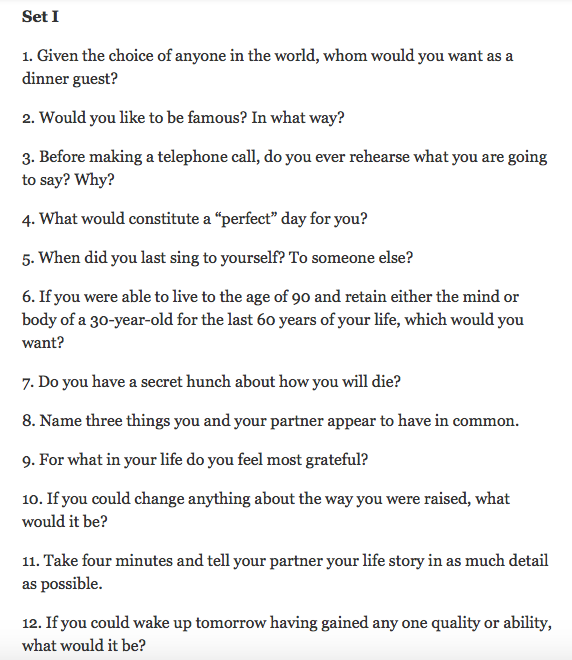 The questions cover a huge range of things – many of which you wouldn’t know about your other half unless you expressly asked. And from someone who normally does more than her fair share of talking in a conversation, it was really nice to give the Rugby Boy some air time for a change, and to properly listen. This article is everything and more. Broadens the perspective in which one should use in finding Love. Great read! !